At a party I was denied the opportunity to tell the story of Dali getting his head caught in the diving helmet and almost suffocating. Young men. I generally pursue the oldest attendees at a party, as I figure they have more good stories, and I particularly love talking with older women, who are our nation’s most underutilized resource for pretty much everything. They are almost always the most interesting people at parties, women over fifty. But the older the better. This may be part of why I am single. Have you ever been rescued by a poet with a hammer? That incident is my favorite of Dali’s work. I don’t much care for melted watches. I went to a yoga class, the teacher touched my chest, just below my collarbone, with one finger that was scented with something beautiful. If you break your collarbone, you may not get to go to the Olympics. That is another story I know. I really love young men for their looks, but they are so unobservant, it’s tragic. I had a dream last night that was awful, and when I woke up, I knew I had to move back to Kansas City and have a kid (how remains unclear, you know, just have one, the getting who knows, but have) and give up this whole experiment, which I regard as 60% failure and 40% success, see I am a numbers person, in my way. I like percentages. Some days I regard it as 90% success, it depends on if I have done something awesome that day, if someone has said, “It’s good to see you,” if I am loving New York, which I still do love, more than everything, more than ever, New Yorkers, I love, and always the trash and the strange tenderness of very tough and slightly frightened people, if I am writing well, or I am in a mood that is more determined, honestly, I think, by the randomness of brain chemistry than my outside circumstance. The brain is happy. The brain is bored. The brain likes one glass of wine. So you know something, after a dream, is that knowing? I’ve spent the last two weeks in what looks like an enviable whirlwind of sightseeing, it was that, it was also people who loved me keeping me marching, doing things so interesting and/or pleasant that I could hardly be annoyed, which I needed. I hate everyone who has some big wonderful thing show up and save them from out of nowhere. Donald Trump doesn’t bother me in the slightest, though. I feel great about Republicans right now. I might kiss one out of pity. Maybe even on the mouth. Thomas Jefferson’s round library did me the most good. The crowd screeching in pleasure when the panda got up and merely walked across his room was also helpful. All the art helped, an hour at the Hirschhorn and some photographs the color I wanted to squeeze out and drink. Also some paintings I didn’t like, that is always useful, and a table superimposed on a volcano. What was that about? I knew it was about something. The priest at the cathedral blessed me, and this time I didn’t cry, which was nice because we Episcopalians don’t like to cry except in emergencies, and we do not have public emergencies. I wasn’t feeling so messed up this time, last time I was there, and happened to be there for the laying on of hands, I was very upset about both the Holocaust and my own broken heart, they were hitting me right in the same place, well, that is what happened. Other people who were blessed probably had cancer, that’s always why the rest of us should be all right, right? We don’t have cancer. I was at the beach, one guy made a sand castle that looked like stalagmites. A boy held a plastic bag of sea water. Sea gulls flew up so high they seemed to be just looking things over, what purpose did that serve for them? The Dali story, no idea of accuracy, but then, I don’t care. 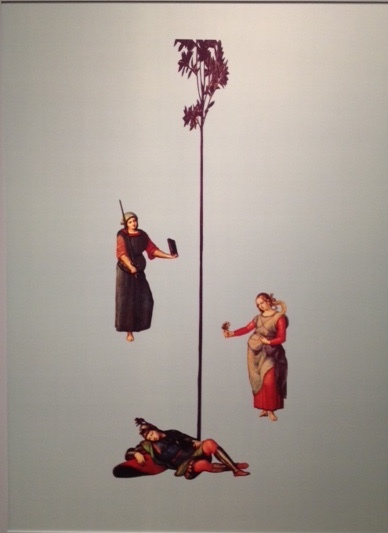 Image: Sarah Charlesworth, from Renaissance Paintings, currently at the New Museum.